Family-friendly places like Lisbon Oceanarium and Belém Tower will thrill your kids. Step out of Lisbon to go to Sintra and see Quinta da Regaleira, which is approximately 36 minutes away. There's lots more to do: contemplate in the serene atmosphere at Jeronimos Monastery, don't miss a visit to Santa Justa Lift, pause for some photo ops at Padrao dos Descobrimentos, and take in the exciting artwork at Museu Calouste Gulbenkian. For photos, other places to visit, maps, and more tourist information, refer to the Lisbon day trip tool . Mexico City, Mexico to Lisbon is an approximately 16.5-hour flight. You can also do a combination of bus and flight. The time zone changes from Central Standard Time (CST) to Western European Time (WET), which is usually a 6 hour difference. In May, daily temperatures in Lisbon can reach 28°C, while at night they dip to 15°C. Finish your sightseeing early on the 30th (Thu) to allow enough time to drive to Lagos. Eschew the tourist crowds and head to Falesia Beach and Slide & Splash - Water Slide Park. Kids will enjoy Praia Da Rocha and Praia Dona Ana. Next up on the itinerary: take in the dramatic natural features at Ponta da Piedade, see majestic marine mammals with a dolphin and whale watching tour, take in the waterfront at Alvor Boardwalk, and don't miss a visit to Lagos Farol da Ponta da Piedade. To see photos, reviews, other places to visit, and tourist information, read Lagos trip itinerary planner . Drive from Lisbon to Lagos in 3 hours. Alternatively, you can take a bus; or do a combination of flight and bus. In May, plan for daily highs up to 28°C, and evening lows to 18°C. Wrap up your sightseeing on the 3rd (Mon) early enough to travel to Ponta Delgada. Bring the kids along to Dolphin & Whale Watching and Furnas Monitoring and Research Centre. 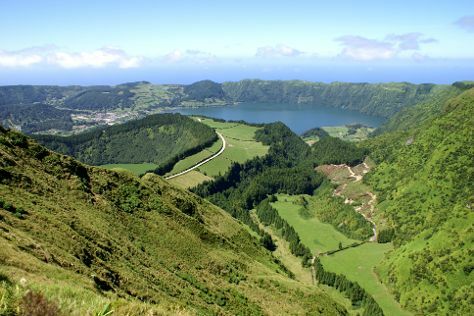 Eschew the tourist crowds and head to Caldeira das Sete Cidades and Environmental Interpretation Centre of Caldeira Velha. Venture out of the city with trips to Furnas (Parque Terra Nostra & Poca Da Dona Beija). Next up on the itinerary: explore the activities along Lagoa do Fogo and take some stellar pictures from Boca do Inferno Viewpoint. To find other places to visit, maps, traveler tips, and tourist information, read our Ponta Delgada online trip builder . Traveling by combination of bus and flight from Lagos to Ponta Delgada takes 9 hours. Alternatively, you can do a combination of train and flight. Traveling from Lagos to Ponta Delgada, you'll gain 1 hour due to the time zone difference. Traveling from Lagos in June, expect nights in Ponta Delgada to be about the same, around 19°C, while days are a bit cooler, around 24°C. Wrap up your sightseeing on the 6th (Thu) to allow time to travel back home.